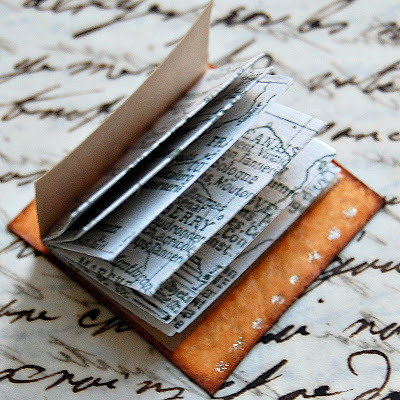 Lululiz in Lalaland: A moth ate my Travel Guide! Not really, I was just trying once again to get both challenges into one blog title. We are still in the UK, as we need to take care of some elderly parents and elderly auntie stuff, but we are hoping to be on our way in a week's time. Can't wait. 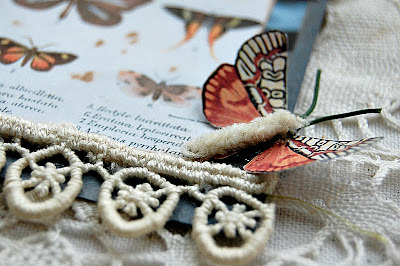 that inchie is the most wonderful little travellers guide ,ever!! 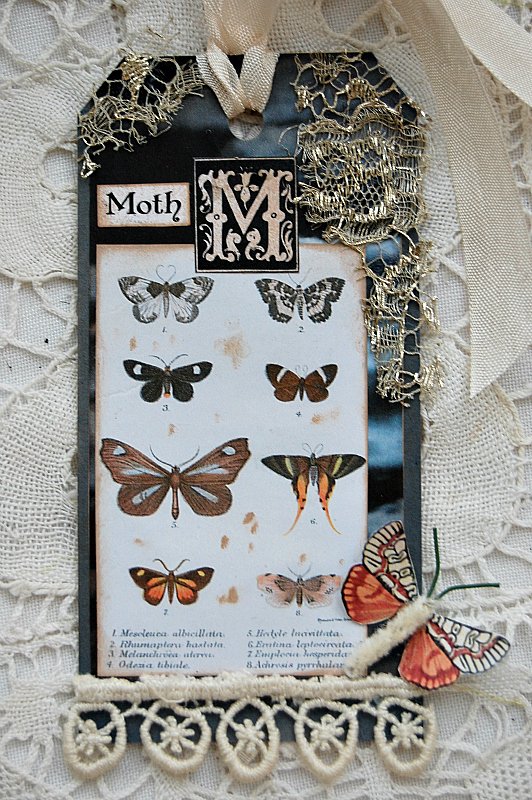 and your Moth tag,with your gorgeous photo behind, and the cutest little moth in 3-d, is a brilliant take of the letter-M- beautiful both my dear friend. You are so funny, I love it! You clever girl. Love both creations, especially the tiny travel inchie. 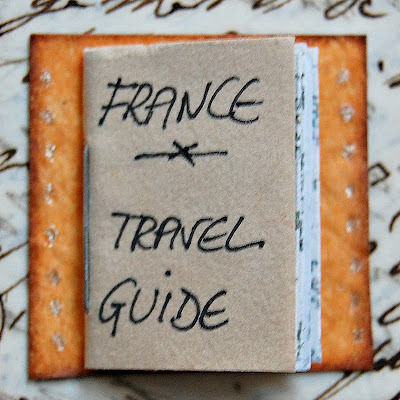 I'm sure I would find my away around France with that dear little guide - moth eaten or not! Oh that is some page of gorgeous moths dear Liz - it must be a beautiful book! 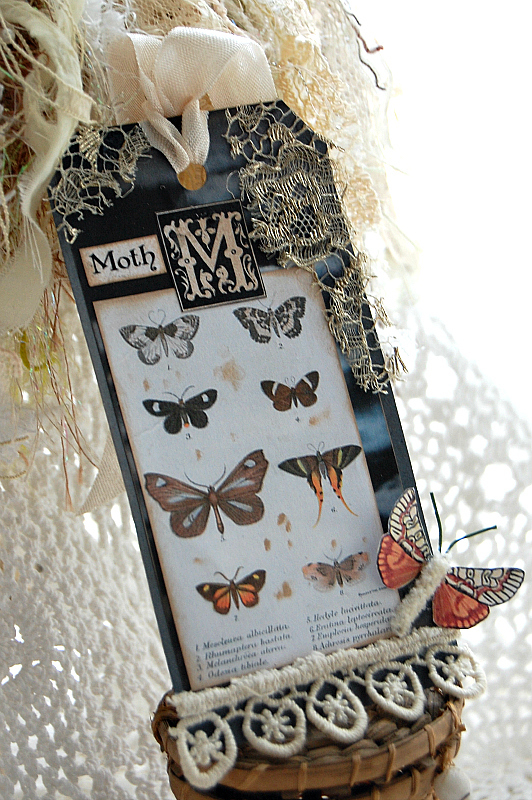 Love it mounted on your own photo with the 3D moth in the corner. Your projects are lovely, Liz. What a precious little book! You did a great job on both! Love that cute little travel guide and the moth tag is beautiful. You make such wonderful tags. How do you display all of them? I'd love to see a photo of how you use them. I think your post title was perfect by the way! Dein Tag ist klasse geworden meine Liebe. Und die Gummistiefel in deinem Banner sind der Hit ... super schön. love both of your projects.Gorgeous. Here I was going to say OH NO!!!! LOL Aren't you clever with your title! What a Gorgeous tag Liz, They look like butterflies their so pretty! So nice to meet you. Lanette from Betsy's Heartstrings came to visit Utah from Washington and couldn't stop talking about you so I had to come visit! Both creations are gorgeous, Liz! I especially love the lil travel inchie guide.